This image is just over a day old. In the time since it was taken and the time that I'm posting it MESSENGER has flown 300,000 kilometers closer to Mercury, 18% of the remaining distance....here we come! I'll follow this image with the two posted on previous days so you can see how Mercury is growing in the forward view. 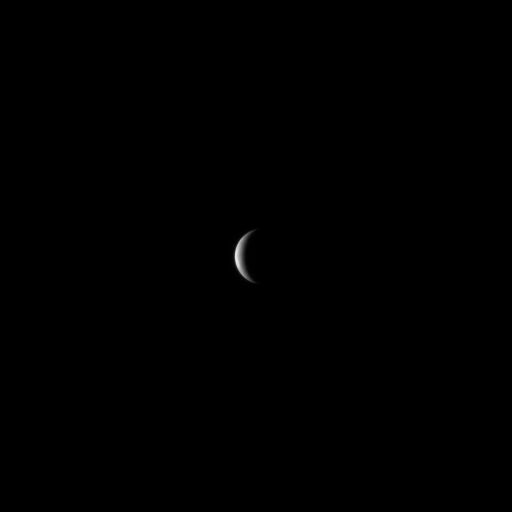 MESSENGER snapped this image of a crescent Mercury through its narrow-angle camera on January 11 at 09:06 UTC when it was about 1.7 million kilometers from the planet. Mercury's still too small in these pictures for there to be anything much to be gleaned from them. They're not taken to study Mercury, they're taken for optical navigation purposes. Each of these narrow-angle camera images is taken at about the same time as a wide-angle, long-exposure view to show Mercury's position against the background star field. Comparing those views to predicted ones tells the navigators how close they are to their desired course. I think it's poetical that, in this day and age, with robots exploring space, we still steer by the stars.